When many of us think of direct selling businesses, a digital-first approach isn’t what springs to mind. But for the team at Amway, the world’s number one direct selling and multi-level marketing company, embracing digital across everything from sales collateral to how an independent business owner (IBO) operates is the key to ensuring its future. Amway is an $11.8 billion business operating in more than 80 countries and territories and with 100,000 IBOs across Australia and New Zealand. Since launching in 1959, it has paid out $47bn in bonuses to IBOs globally. Known originally for soap suds and washing powder, the group now focuses primarily on nutrition and beauty categories, sourcing ingredients for the 15 billion vitamin tablets it produces a year from 7000 acres of owned organic farmland. Although it continues to chalk up consecutive years of growth both in emerging and mature markets such as the US, embracing digital has become increasingly in meeting the expectations of current and future IBOs as well as end customers, Amway’s head of sales and market development for Australia, John Haines, told CMO. What may surprise a few readers is that half of all prospects signing up to become Amway distributors are Generation Y. Given these digital natives prefer to communicate and address customers through online channels, Amway made the decision three years ago to go digital too, Haines said. “This Gen Y trend isn’t just happening in our market, it’s happening across the globe. If you don’t tap in and embrace that new type of audience, you end up with a business that’s old fashioned,” he claimed. The first component of Amway’s strategy was transitioning away from printed collateral to digital form. 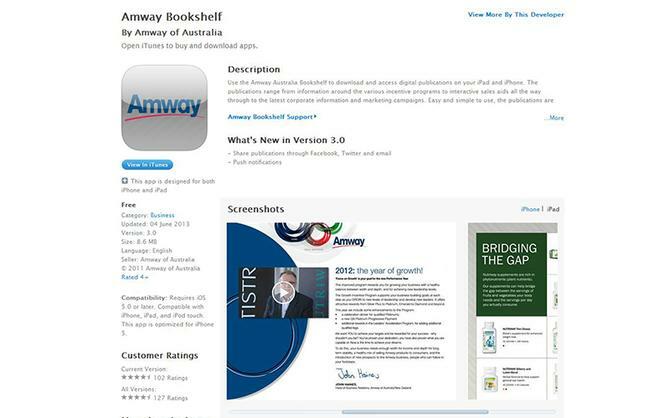 Following an investment into Adobe’s Digital Publishing Suite 18 months ago, the company created the Amway bookshelf app for Google AppStore and Apple iTunes. Today, it has 35 different publications on the bookshelf and aims to add a new publication every month, Haines said. These publications act as sales toolkits for business owners, and feature product information, clinical research papers and articles on how products are manufactured as well as interviews with scientists behind the innovation of new products and patents. 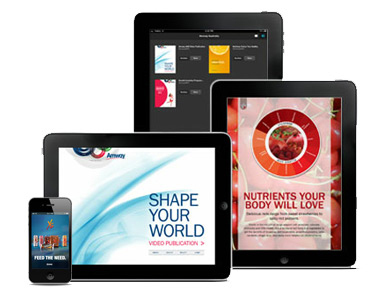 To date, Amway has chalked up 1.5 million publication views and more than 90,000 downloads. Later this year, it plans to translate several of the publications into Chinese languages to reflect the changing ethnic background of Australia’s population. About 20 per cent of business today is coming from Asian ethnicities, Haines added. The next phase of Amway’s global digital push is to allow IBOs to manage their business in the digital and mobile space. To do this, it will launch the ‘MyBiz’ app in June. The project is being headed up by the global development team and shared across all territories. “What this will do is give all IBOs the opportunity to view their business on both a local and international level,” Haines explained. 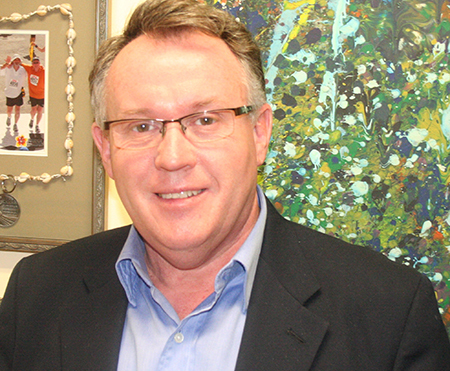 “A lot of distributors have businesses not just in Australia but also other geographies. This will give them a real-time view of what their business links are doing, and who are the people in their lines of sponsorship. They will be able to put filters on some of the information to see who is growing within their businesses, and who is qualifying at different levels. This month, the Australian team also rolls out the ‘check express’ app, which allows consumers to scan the barcode on a product in one of its business centre locations and view a video or audio representation of all the features and benefits. Haines admitted going digital has been an interesting journey for the executive team. “Initially when we launched it [the bookshelf], it was quite a culturally different thing to embrace,” he said. “I won’t say it’s been easy – it’s easier for the younger generation but we have a lot of older IBOs as well and we’ve had to undergo a lot of training to help them adopt this new approach to business.” Training is increasingly being offered in webinar format, and Amway’s senior leaders were handed tablet devices when the company began rolling out its digital strategy to help them embrace the new business model, Haines said. The metrics are stacking up. As a result of going digital, Amway reduced print costs by 70 per cent in the last three years. Importantly, distributors have tools they can use anytime of the day, Haines said. A digital platform also allows Amway to quickly update and share information with IBOs as well as understand how they are utilising tools provided. Haines gave the digital switch credit for helping to increase both nutrition and beauty category sales, and said Amway is working to deliver more information materials in these areas to support further growth in both product lines. Other measurements used to understand digital’s impact include profitability of IBOs, the number of Gen Y people joining the business, and renewals. While it does offer the ability to link through its app to the Amway website and place an order, Haines admitted there is more work to do in this space to make it a seamless transaction for an end consumer. Australia is a pioneer in the wider Amway group for digital, and at the forefront of what is being offered globally, Haines said. As part of its digital push, the company has invested in hundreds of staff regionally and globally, and the Australian team heads up South East Asian development.